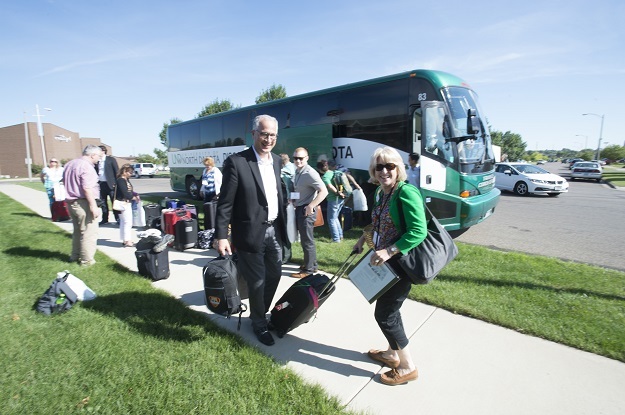 President Mark and First Lady Debbie Kennedy hosted the 26th Annual New Faculty and Administrator Bus Tour of North Dakota, Aug. 15-17. This was the first bus tour for the Kennedys. President Mark and First Lady Debbie Kennedy pick up their gear at one of the stops on the New Faculty and Administrators Bus Tour. Of the multiple purposes for hosting the bus tour, familiarizing new faculty and administrators with the state while connecting them with alumni, state and community leaders is the primary focus. The tour also gave the more than 30 new UND faculty members and administrators a chance to develop professional relationships. 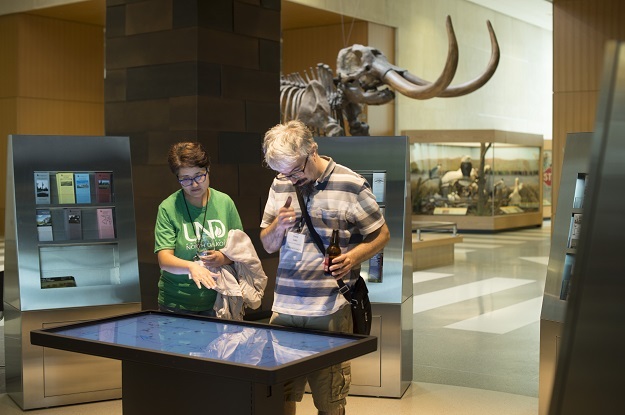 New faculty members check out exhibits at the North Dakota Heritage Center in Bismarck. 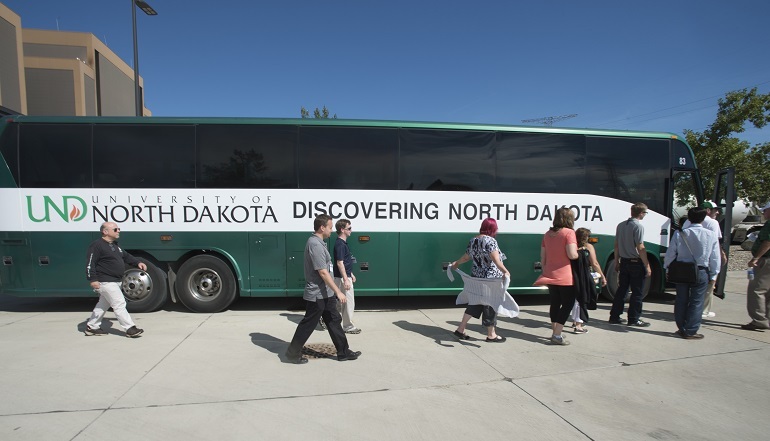 “The bus tour is always a great opportunity for us to introduce our new faculty and administrators to North Dakota. They learn about where their students come from. Throughout the tour, several guest speakers share information about the three pillars of the economy ― agriculture, energy and tourism ― as well as about what makes North Dakota unique from a historical, cultural, societal, and political perspective,” said Peter Johnson, UND interim vice president for University & Public Affairs. 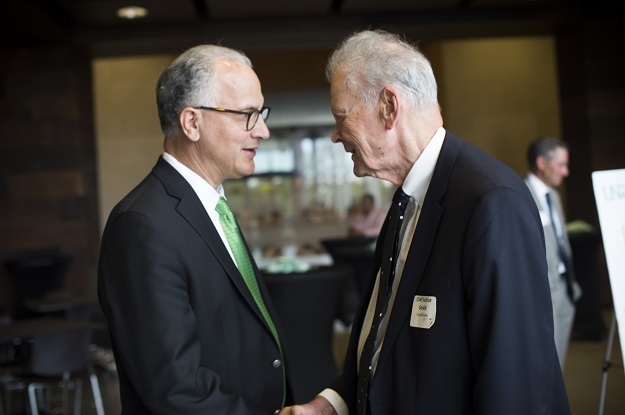 President Mark Kennedy (left) exchanges greetings with North Dakota Supreme Court Chief Justice Gerald VandeWalle, a UND alumnus. The tour alternates between a northern route and a southern route each year. This year the tour followed a southern route through the state, stopping at places such as Mayville, Carrington, Washburn, Medora and nearby Theodore Roosevelt National Park, Bismarck-Mandan and Fargo-Moorhead.